But as we are lazily prone to say when a bit confused, the truth lies somewhere in the middle. The problem though, is that the middle is a huge space in Malaysian politics at the moment, meaning that the options are numerous. While the BN did seem to have a slight advantage even after nomination day on April 20, the 15-day campaign period has seen the opposition catching up, not only through the numbers attending their rallies, but also through their capture of the public imagination. That is in fact what the political battle is about – the coalition will win which can best express the rising sentiments and aspirations of the new generation. For a quick glimpse of the dynamics in Malaysia right now, one needs to note what the key differences are which are taking shape as the campaign chugs towards May 5. For one thing, we are dealing with coalitions more than with parties or individuals now. Whether the BN is running a presidential campaign or not with the prime minister as its main selling point, voters are pitching one coalition against the other. This has largely been brought about by Pakatan Rakyat’s success in presenting itself as a cohesive force, not only through speeches, but also visually. An astounding array of good speakers is being fielded by Pakatan, which easily overwhelms BN’s singular focus on Najib. We are seeing a continuously growing movement that has clearly gone way beyond Anwar Ibrahim or Lim Kit Siang or Lim Guan Eng or Nik Aziz Nik Mat, or any of the many Pakatan leaders that have appeared on the scene. This imbalance in leadership personalities alone should worry the BN, which realised this vital deficiency a little too late. Throughout the Mahathir Mohamad era, we saw the career of Umno leaders successively destroyed, and the integrity of the party’s allies compromised into obscurity by its dominance and arrogance. A vacuum was thus created to be filled by mediocre leaders, with Mahathir still in the background. To counter this impression, Najib tried as hard as he could to run as many new and relatively young faces as possible, which instead upset a lot of BN second-rank leaders who had been patiently waiting their turn at power. Furthermore, it is very doubtful whether these hastily selected ones can match the dynamism of the young Pakatan candidates. 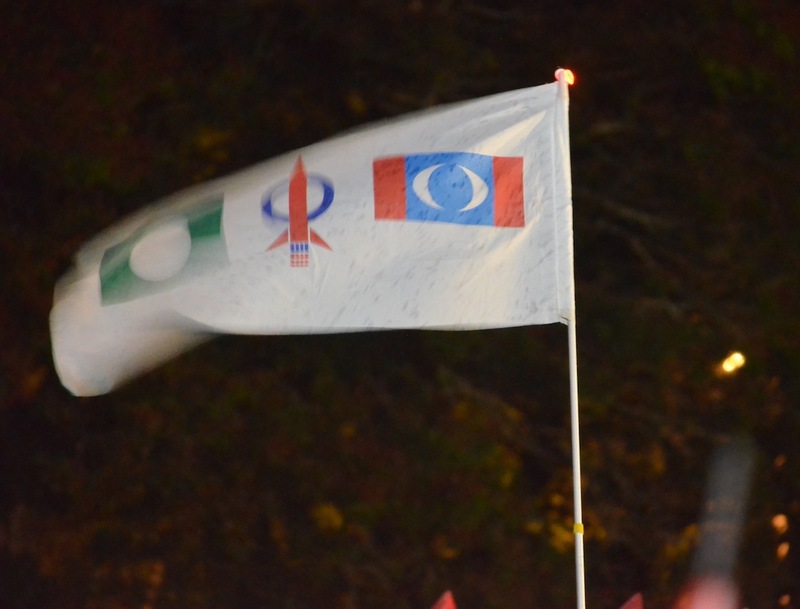 The fact that the three opposition parties – DAP, PKR and PAS – are not integrated under one colour, one banner and one leader, is now a vast source of strength at the moment. Pakatan’s diversity is not a sign of disunity at all. The three opposition flags are comfortably flaunted alongside each other on cars, on streets and shop-houses, at rallies – and most importantly, on T-shirts popularly worn by young and old. Their party symbols are formalised alongside each other for the occasion, and one sees young Malays wearing T-shirts bearing Lim Kit Siang’s face, and Chinese boys wrapped in PAS flags. 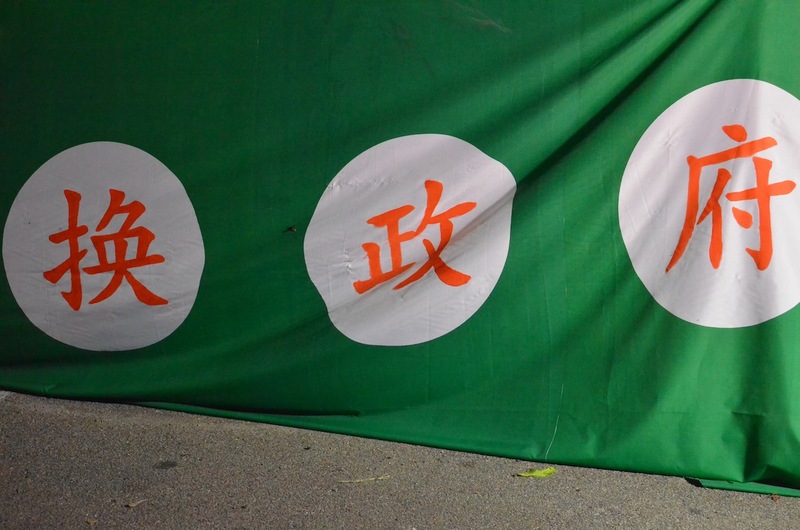 One even sees Chinese characters printed onto the Muslim moon in the PAS’s party symbol. We are definitely seeing a war of colours in this election campaign. 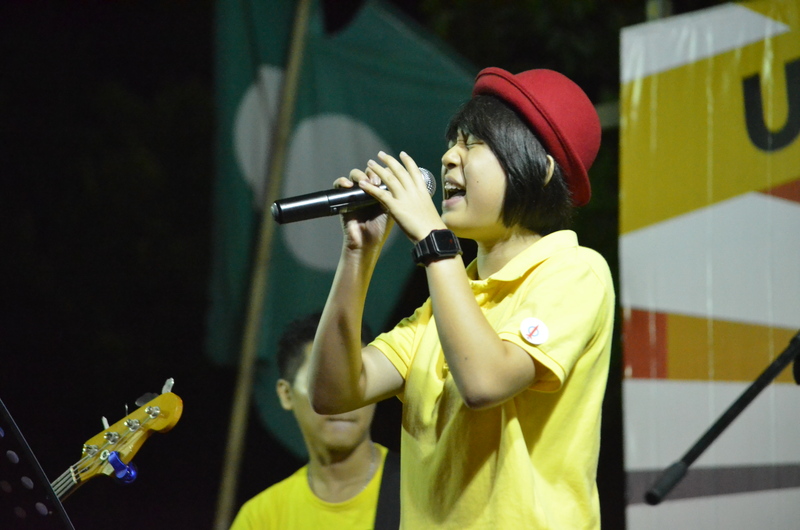 Against the BN’s singular blue colour, Pakatan is celebrating not only the colours of the member parties but also the colours adopted by recent NGO movements, be it red, green or yellow. If one adds to this the orange that represents the coalition, one ends up with a rainbow range of pedestrian colours worn by common folk walking the streets and attending the rallies. Interestingly, the fact that the environmental movement against the establishment of the Australian rare earths factory in Lynas uses the same colour as PAS, the Islamist party, breaks down one more barrier in Malaysian consciousness and political correctness. 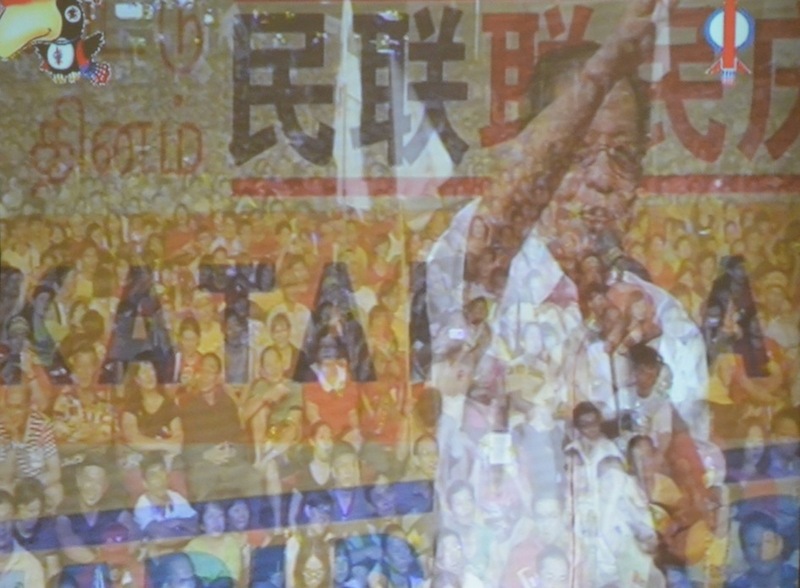 This complex crossing of conceptual turf was given an unexpected push two days before nomination day when the Registrar of Societies announced that it would not accept the legal status of DAP’s central executive committee, making it doubtful whether the DAP’s party logo could be used by its candidates. This led to a swift response from the DAP that its candidates would in that case use PAS’s or PKR’s logo instead. This show of solidarity in Pakatan also broke another mental block in many Malaysian minds. Keeping one’s turf and letting others keep their turf had always plagued the Malaysian mind, and is something often considered the legacy of British colonialism. The crossing of such divides will decide the future of Malaysia’s political scene. Without embarking on the equally critical discussion of how issues are being handled in the campaign, one has to say already that the BN faces an impossible task in the last days before May 5 to turn the tide in the war of symbols and slogans. OOI KEE BENG is the deputy director of the Institute of Southeast Asian Studies (ISEAS). His latest book is ‘Done Making Do: 1Party Rule Ends in Malaysia’ (Genta Media & ISEAS 2013). 505: This 13th GE is also the battle of the traditional propaganda main stream media 10 tons machines against the alternate media fought all fonts via social media, Facebook, YouTube, twitter, online TVs and massive people campaigns via rallies, dinners and ceramahs. Never before has the citizens of Malaysia tasted this new found freedom that capture the imagination of the ordinary citizens. The people’s voices, shut out from the main media have now reverberated across the country, across the world by just a click of one’s mobile phone, tablets and PCs. ineffective propaganda wherein the people are stone- deaf to such propaganda. With the readers’ minds switched off from the main stream media, the tons of printed propaganda materials are now just garbage wrappers to be thrown into dustbins . Whereas the alternate news spread via social media is ever engaging as its stick like leaches to the readers’ mobile devices, to be reformatted and transmitted in whichever way they want. Such reformatted news spread like wildfire from children to parents, from parents to grand parents, from siblings to relatives, from collegues to friends from one country to another across the globe. We no longer live in an isolated sanitized coconut shell, for the world watches us now and we are able to communicate the truth with our brothers, sister, parents, friends, fellow country men and women across the globe. We are now a Malaysian first and a global citizen second. No longer will we be defined and boxed in as racial components of this new malaysia. The people has spoken. The incumbent politicians must now listen listen listen to the aspirations of the citizens instead or become irrevelant. The dice is cast. There is no turning back. The time is NOW. 3 days to a new malaysia. 06052013:- A new malaysia reborn. The end of “controlled” reporting. 505: This 13th GE is also the battle of the traditional propaganda main stream media 10 tons machines against the alternate media fought all fronts via social media, Facebook, YouTube, twitter, online TVs and massive people campaigns via rallies, dinners and ceramahs. Never before have the citizens of Malaysia tasted this new found freedom that capture the imagination of the ordinary citizens. The people’s voices, shut out from the mainstream media have now reverberated across the country, across the world by just a click of one’s mobile phone, tablets and PCs. This new media machine is a classic study of Sun Tze art of war. Know thy enemy, know thyself. It is the battle of the small man against the giant war lords. Of David against Goliath. Of guerrilla attacks against the protected fortress of the incumbents. it also illustrate the power of effective marketing campaigns on how to mobilize the masses, of engaging with the citizens in 2-way bottom up communication against the top down Listen Listen Listen ineffective propaganda wherein the people are stone- deaf to such propaganda. With the readers’ minds switched off from the mainstream media, the tons of printed propaganda materials are now just garbage wrappers to be thrown into dustbins . Whereas the alternate news spread via social media is ever engaging as its stick like leaches to the readers’ mobile devices, to be reformatted and transmitted in whichever way they want. Such reformatted news spread like wildfire from children to parents, from parents to grand parents, from siblings to relatives, from colleagues to friends, from one country to another across the globe. We no longer live in an isolated sanitized coconut shell, for the world watches us now and we are able to communicate the truth with our brothers, sister, parents, friends, fellow country men and women across the globe. We are now a Malaysian first and a global citizen second. No longer will we be defined and boxed in as racial components of this new Malaysia. The people have spoken. The incumbent politicians must now listen listen listen to the aspirations of the citizens instead or become irrelevant. The dice is cast. There is no turning back. The time is NOW.